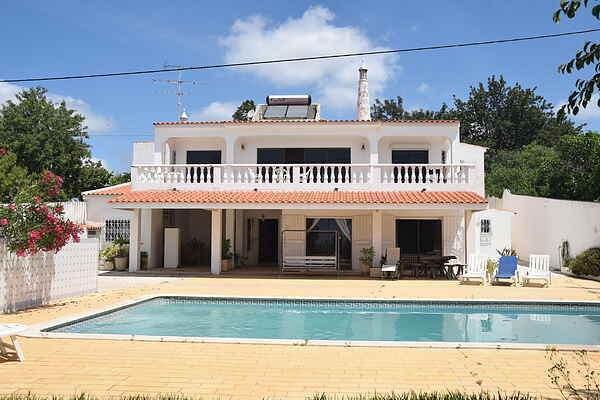 Detached holiday house with private swimming pool located in Maritenda, a 10 minutes drive from the center of Vilamoura. This holiday house overlooks the golf courses from Vilamoura, the coastline and a wetland nature reserve with a variety of wild flowers. The holiday house is rustically decorated and fully equipped. This holiday house is set in fenced garden with a separate BBQ area and is the perfect place to relax. From the several terraces and roof terrace you have a wonderful view overlooking the swimming pool, the country side and the ocean. The owner is living nearby on the same plot but you will maintain your privacy. The holiday house is just 6km away from the beach. The beaches in the Algarve are renowned for their fine, golden sand which shimmers between the blue of the sea and the bold ochre of the cliffs. The surroundings offer excellent opportunities for golfers and from this location you have access to all major sights and monuments. Recommended places to visit include the seaside resort of Albufeira, Falesia, Olhos de Água and Cabo de São Vicente, the rugged most south-westerly point of Europe is an hour and 20 minutes drive from the holiday home.